THIS was supposed to be a ‘decade of centenaries’, but Peter Robinson thinks it’s going to be a ‘decade of decision’ on Northern Ireland’s constitutional future. The Detail’s Steven McCaffery reports from the Democratic Unionist Party’s annual conference. 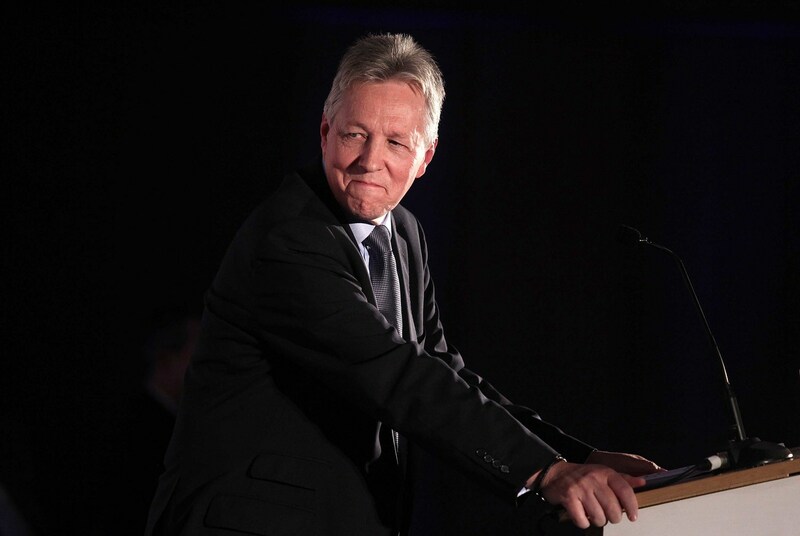 WITH the release of the latest census figures on Northern Ireland’s religious breakdown only days away, Peter Robinson has sought to persuade his party that the growth of the Catholic population could be unionism’s secret weapon. The DUP leader denies he is ready to leave the political stage any time soon, despite approaching his 64th birthday, but his televised party conference speech clearly spelt out how he hopes to secure his legacy. For at a time when republicans are demanding a border poll to kick-start a debate on Irish reunification, Mr Robinson insists large numbers of Catholics are already debating a long-term future in a reformed Northern Ireland – if only the DUP’s hardline base can stomach further compromises to seal the deal. The results of the latest 10-yearly census will be released on December 11, revealing whether or not the growing Catholic population has continued to narrow the gap on the larger Protestant community. But the DUP leader believes he can trump any demographic trend. His previous appeals to the Catholic electorate have been dismissed as ill-disguised efforts to win-over liberal unionists put-off by the DUP’s hardline history. But he has now spelt out that Sinn Féin’s long-term plan to win a border poll, could be derailed in the near future, if nationalists can be made as a comfortable as possible in a new Northern Ireland. The message is `if Catholics won’t vote for the Union, let’s at least make sure they don’t vote against it’. One of Mr Robinson’s most noted forays into cross-community politics came in 2010 when he branded Northern Ireland’s religiously segregated school system as a “benign form of apartheid”. The full extent of the continuing divisions between Protestant and Catholic schoolchildren have been examined in depth earlier this week by The Detail here. Mr Robinson’s robust language in 2010 sparked major media attention and was widely read as a progressive bid to break with the sectarian past. But his additional criticism of faith schools and his objection to the state “providing and funding church schools” drew criticism from Catholics. This week the Alliance party’s Trevor Lunn repeated fears that the DUP’s vision of integrated education “appears to be as part of an aim to abolish the Catholic school system”. But the education debate hints at a wider political consideration – the growth of Northern Ireland’s Catholic community. Estimates in 1981 put the Catholic population at 38.5%, and by 1991 that had risen to 41.5%. The 2001 census was expected to be the most extensive ever held in Northern Ireland and its results were hotly anticipated. There were predictions that the Catholic population might jump as high as 47%. But a more modest increase emerged, with Catholics put at 43.76% of the population and Protestants at 53.13%. The Northern Ireland Statistics and Research Agency will release the results of the 2011 census at 9.30am on December 11. The findings will be studied with interest to see if the phenomenon of 2001 is repeated – when the flow of population in and out of Northern Ireland was thought by some to have slowed the narrowing of the religious gap. If, however, the trend of Catholic growth is shown to be continuing, this will fuel speculation around the future shape of Northern Ireland society, especially given figures that put the school population at 51% Catholic and 37% Protestant. Such crude sectarian headcounts are inevitable around the next census scheduled for 2021 – which coincides with the centenary of the establishment of the Northern Ireland state. The outworking of the demographic ebbs and flows is not certain, and must be measured against the possibility that population trends can shift. It is also possible that a larger Catholic community might feel more confident of its ability to shape its own destiny, eroding the demand for constitutional upheaval. Mr Robinson hopes his party can take the necessary steps to tempt nationalists in that direction. After a summer when a section of unionism tied itself in knots over loyal order marches, as reported by The Detail here, Mr Robinson made no mention of the parades issue in his speech. His appeal was for unionists to see the big picture. Wider questions may emerge, including whether unionists will embrace a ‘greener’ Northern Ireland – is the ‘Union’ more important than ‘Unionism’? An early test is likely in the next 12 months when Sinn Féin and the DUP are expected to enter talks around reforming the structures of the Stormont power-sharing government they lead. Republicans are likely to have their own wish-list, including issues such as legislation to promote Irish language and culture. The DUP is seeking to maximise its position in Northern Ireland, at the same time that Sinn Féin is trying to capitalise on its growth south of the Irish border. The potential for a future demographic shift in Northern Ireland is also being noted. This all comes into play as Peter Robinson – plus Martin McGuinness and Gerry Adams – enter the final phases of their frontline political careers. It is `game on’ . Who can secure the strongest legacy?